Frederick H. Rowe was a lawyer and businessman who became active in Republican politics. He served as the secretary to Governor Richard Yates of Illinois, and as the chairman of the State Republican Party. 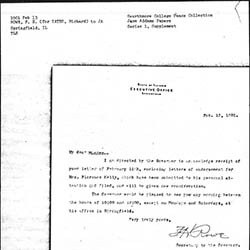 Rowe then became an attorney for the state insurance department. After 1907, he ran an insurance business. Rowe lived to be 100 years old, dying in 1958. Rowe married Marietta Mathers in 1884. They had three children: Cole Y. Rowe, Richard Y. Rowe, and Millicent R. Samuell. "Frederick H. Rowe: Oldest Williams Alumnus, 100," Berkshire Eagle, July 12, 1958 , p. 10. "Mrs. F. H. Rowe Taken By Death," Jacksonville Daily Journal, July 31, 1931, p. 17. “Rowe, Frederick H. (1857-1958),” Jane Addams Digital Edition, accessed April 22, 2019, https://digital.janeaddams.ramapo.edu/items/show/89.